The overall objective of this research was to contribute to a better knowledge of the phytosociology, ecology and distribution of the plant community formed by Myricaria germanica (false tamarisk) and the willow species Salix purpurea. This plant community has an important role in reducing the speed and strength of the water flow during floods. The description was based on cover‐abundance data for the faithful, dominant, characteristic and companion species of this plant community. A predominance of Myricaria germanica was observed when analysing the phytocoenoses, as the species finds in this area favourable ecological conditions for an abundant development. Salix purpurea presents a small abundance-dominance or in some phytocoenoses may even lack. The field research also revealed the excessive development of the species Calamagrostis pseudophragmites in some areas, related mostly with the effect of human activities. The anthropogenic disorders have induced modifications in the floristic physiognomy and compositions of the phytocoenoses, favouring also the invasion of opportunistic species such as Ambrosia artemisiifolia, Impatiens glandulifera, Phytolacca amearicana, Amorpha fruticosa, Erigeron annuus, which continuously extend in the studied territory. As Myricaria germanica and Salix purpurea phytocoenoses suffer a great decline throughout Europe, the habitat built by these species was declared of interest and was included in the Habitats Directive. Brand RF, Rostal MK, Kemp A, Anyamba A, Zwiegers H, Van Huyssteen CW, Paweska JT (2018). A phytosociological analysis and description of wetland vegetation and ecological factors associated with locations of high mortality for the 2010-11 Rift Valley fever outbreak in South Africa. PloS One 13(2):e0191585. Bray JR, Curtis JT (1957). An ordination of upland forest communities of southern Wisconsin. Ecological Monographs 27(4):325-349. Braun-Blanquet J, Jenny H (1939). Vegetations-Entwicklung und Bodenbildung [Vegetation development and soil formation]. Denkschriften der Schweizerischen Naturforschung, Zürich, pp 63. Brown LR, Du Preez PJ, Bezuidenhout H, Bredenkamp GJ, Mostert THC, Collins NB (2013). Guidelines for phytosociological classifications and descriptions of vegetation in southern Africa. Koedoe 55(1):a1103. Buse-Dragomir L, Niculescu M (2016). Physiological particularities of Myricaria germanica species in climatic conditions of Natura 2000 Domogled-Cerna Valley site. Annals of the University of Craiova - Agriculture, Montanology, Cadastre Series 46(2):76-83. Ciocârlan V (2009). Illustrated flora of Romania. Pteridophyta et Spermatophyta (in Romanian). 3rd ed. Ed Ceres, Bucharest, pp 114. Chytrý M (2013). Salici purpureae-Myricarietum germanicae Moor 1958. In: Chytrý M (Ed). Vegetace České republiky. Lesní a křovinná vegetace [Vegetation of the Czech Republic. Forest and shrub vegetation]. Academia, Praha 4:60-63. Coldea G (1991). Prodrome des associations végétales des Carpates du Sud-Est (Carpates Roumaines) [Prodrome of plant associations of South East Carpathians (Romanian Carpathians]. Camerino, Università degli Studi, Nouvelle Série13:319-539. Coldea G, Indreica A, Oprea A (2015). Les associations vegetales de Roumanie. Les associations forestieres et arbustives [The plant communities in Romania. The forest and shrub plant communities]. Presa Universitara Clujeana and Accent. Tome 3:81. Council Directive 92/43/EEC (1992). Council Directive 92/43/EEC of 21 May 1992 on the conservation of natural habitats and of wild fauna and flora. Annex I (Habitats Directive) 15(02):109-152. Donita N, Popescu A, Pauca-Comanescu M, Mihailescu S, Biris IA (2005). Habitatele din România [Habitats from Romania]. Ed. Tehnica Silvica, Bucuresti. Gafta D, Mountford O (2008). Manual de interpretare a habitatelor Natura 2000 din România [Romanian Manual for Interpretation of EU Habitats]. Risoprint Press, Cluj-Napoca, pp 101. IUCN (2018). The IUCN Red List of Threatened Species. Version 2018-1. http://www.iucnredlist.org (Downloaded on 05 July 2018). Marinov Y, Dimitrov D, Gussev C, Pachedjieva K (2017). Current status, distribution and habitat of the threatened species Myricaria germanica (Tamaricaceae) in Bulgaria. Bulletin of the Natural History Museum - Plovdiv 2:21-28. Moor M (1958). Pflanzengesellschaften schweizerischer Flußauen [Plant communities of Swiss river meadows]. Mitteilungen - Schweizerische Anstalt für das Forstliche Versuchswesen 34(4):221-360. Mucina L, Bültmann H, Dierßen K, Theurillat JP, Raus T, Čarni A, … Tichý L (2016). Vegetation of Europe: hierarchical floristic classification system of vascular plant, bryophyte, lichen, and algal communities. Applied Vegetation Science 19(Suppl. 1):3-264. Müller N, Scharm S (2001). The importance of seed rain and seed bank for the recolonisation of gravel bars in alpine rivers. University of Applied Sciences Erfurt, Dep Landscape Management & Restoration Ecology. Leipziger Germany, pp 127-140. Nicolin AL, Niculescu M, Pauca-Comanescu M (2008). Habitat 3230 Alpine rivers and their ligneous vegetation with Myricaria germanica in Natura 2000 in Romania - Habitat fact sheets, pp 62. Niculescu M (2006). Flora si vegetatia bazinului superior al raului Luncavat [Flora and vegetation in the upper basin of the Luncavat River]. PhD Thesis, Babes-Bolyai University, Cluj-Napoca, pp 357. Pazmany D (1969). About the Salici-Myricarietum Moor 58 associations from northern Transilvania. Notulae Botanicae Horti Agrobotanici Cluj-Napoca 4(2):71-76. Podani J (2001). SYN-TAX 2000. Computer programs for data analysis in ecology and systematics. User’s manual. Scientia, Budapest, HU. Rodwell JS, Schaminée JHJ, Mucina L, Pignatti S, Dring Moss JD (2002). The diversity of European vegetation. Raport EC-LNV no. 2002/054, pp 168. Sanda V, Popescu A, Stancu D (2001). Coenotic structure and ecological characterization of the phytocoenosis of Romania. Vergiliu Publishing House, Bucharest, pp 365. Schletterer M, Scheiber T (2008). Wiederansiedlung der Deutschen Tamariske (Myricaria germanica (L.) DESV.) an der Leutascher Ache (Nordtirol, Österreich). 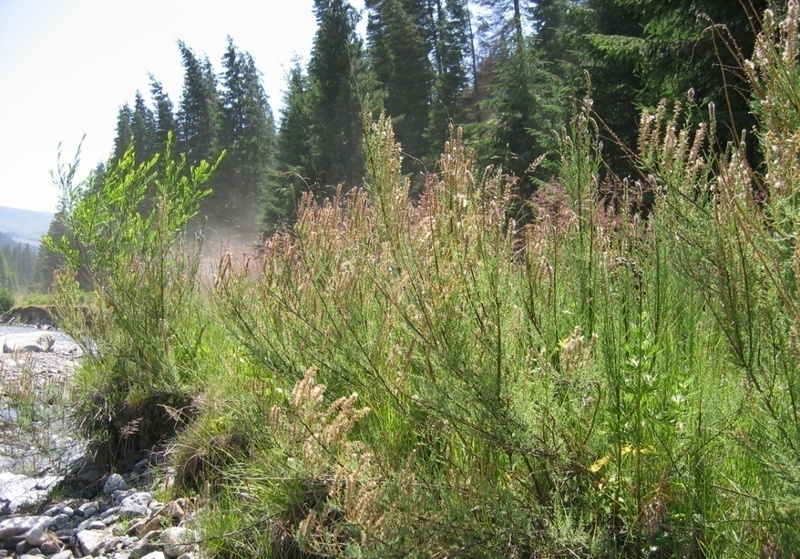 Resettlement of the German tamarisk (Myricaria germanica (L.) DESV.) at the Leutascher Ache (North Tyrol, Austria). Berichte des Naturwissenschaftlichen-Medizinischen Verein Innsbruck 95:53-65. Thiele J, Schirmel J, Buchholz S (2018). Effectiveness of corridors varies among phytosociological plant groups and dispersal syndromes. PLoS One 13(7):e0199980.